Creating a shower that caters to your needs shouldn’t be difficult. We want our bathrooms to be a place to unwind whilst still looking stylish and attractive. We have unveiled our new Kinedo Shower Tray range available in a variety of surfaces, colours, sizes and cuttable options to complement any shower. Our trays also provide options for every budget and come with a warranty of up to 10 years. Our Kinerock tray was launched last year to great reception due to the made to measure versatility of the product. Comfortable, safe and versatile thanks to the textured Biolex surface and six colours that are available. Developed to be used anywhere using our unique patented mineral material that ensures the surface is never cold to the touch. The Kinerock shower tray is just 40mm thick offering easy access into a shower area and is highly resistant to damage and scratches. The Kinestone shower tray may be lightweight but it is one of our most durable, long lasting trays that is resistant to damage. The textured surface is available in six different colours from edgy anthracite to bright and calming sable, complementing the individual taste of any bathroom. The Kinestone shower tray is also made to measure, allowing to be cut on site ensuring correct measurements and minimal fuss when installing. Natural and elegant, the Kinesurf Pietra shower tray will make a statement in any bathroom and looks stunning alongside our new range of Kinedo shower enclosures. The mineral textured tray is simple in design with a robust Biocryl surface creating a grain effect. Available in four colours and with a rigid fibreglass frame, the minimalist design adds sophistication to create a unique showering experience. If you’re looking to add some personality to your shower, the Kinesurf+ is the perfect match. Available in a variety of shapes and colours to completely customise and make your bathroom both unique and personal to you. With a thickness of 40mm and a high-density polymer Biotec reinforcement, the Kinesurf+ shower tray adds as much substance as it does style to your bathroom. More traditional in style, the simplistic and durable stone resin Kinelisse Tray has a low profile and is suitable for commercial and industrial projects. No matter the shape of your bathroom, the Kinelisse is adaptable. The white gloss tray is available in square, quadrant, rectangle and offset spaces and a perfect match for our Fast 2000 range of enclosures. 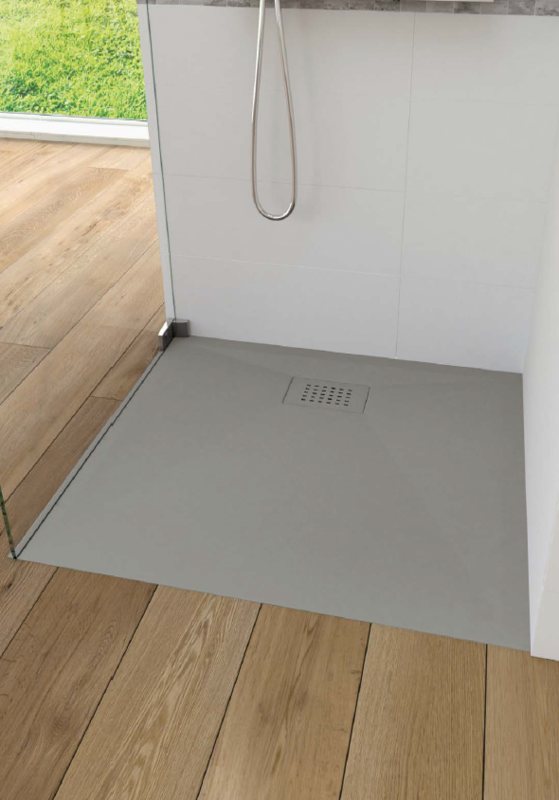 The easiest to install of all our trays, the Sanifloor+ consists of a low-level shower tray, pump and waste. Place directly on the ground with wireless communication and with six versions available, there is a Sanifloor+ Tray to meet most requirements. All trays can be installed in raised, recessed or flat installations. Spoilt for choice and can’t make a decision? Download our Kinedo Shower Trays 2019 Brochure to browse our range, you can also contact us or visit your nearest Kinedo showroom for more information.